Make your payments to all your creditors on time. This includes utilities. Pay at least the minimum on your credit cards. Paying even one day late will affect your credit score. Are you overextended with too many credit cards and outstanding debt? If you have a large credit line, be sure to keep your balance low. The higher your balances, the lower your the score. How long have you had credit is important. Never close your first credit card; it is the start of your credit history. Showing a good payment history is important. Taking on new debt and applying frequently will lower your score. Frequent credit inquires makes it look like you’re shopping for credit. Try to limit new credit applications to once every two years. The ratio of unsecured vs. secured accounts will impact your score. Mortgages and auto loans are secured while credit cards are unsecured. Try to have a good mix - your rates on all loans may be lower. Remember Community Financial is here to help you understand your credit score and can provide a free credit review. 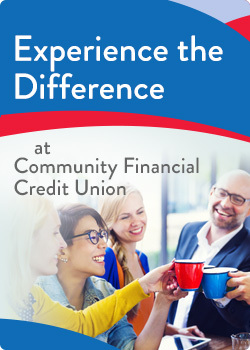 Simply visit a branch near you or call (877) 937-2328.